Available now for digital download. Available March 6 on Blu-ray, DVD and on demand. The biggest problem with “Mockingjay” is that it splits the narrative of a single book in two, forcing viewers to wait an extra year and buy an extra ticket in order to get the full story. There are plenty of arguments against this increasingly common practice, and “Mockingjay” illustrates their validity. Obviously, studios are ecstatic when they can squeeze extra cash from a project, but only rarely are these multipart movies as artistically satisfying as those that take the traditional route. Despite all the things this series does right, “Mockingjay – Part 1” closes with a whimper, leaving viewers with a so-so cliffhanger that fails to deliver the thrills of “Catching Fire.” That seems odd because this is the movie that broadens “The Hunger Games” world, moving viewers beyond gladiatorial drama and into a full-fledged war film. 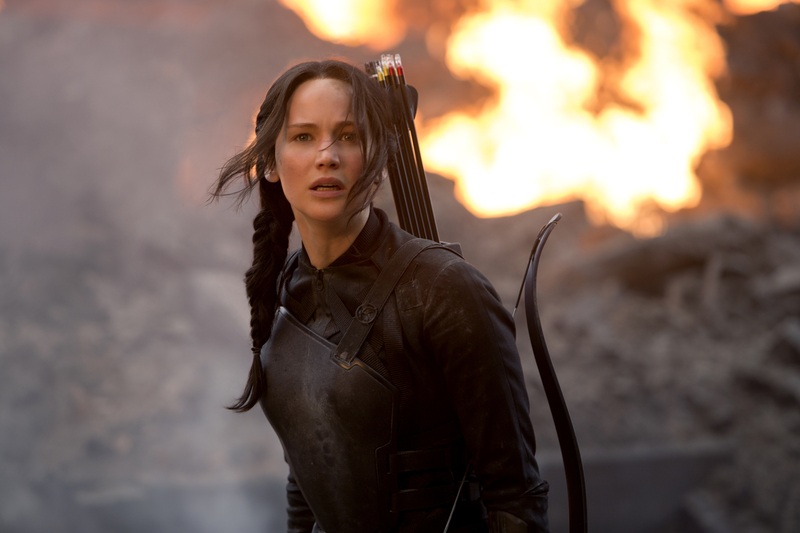 The movie opens directly after the events of “Chasing Fire,” with heroine Katniss Everdeen (Jennifer Lawrence) and a few fellow Victors having been rescued from the Hunger Games arena. Immediately, this group is whisked away to District 13, a powerful, heavily militarized underground city that has long been preparing for war against the fascist capitol of Panem. The president of District 13 (Julianne Moore) explains that other districts are already rebelling, and she wants Katniss to fuel the fire with her celebrity. Although she is sympathetic to the cause, Katniss is uninterested in helping, in large part because her rescuers failed to retrieve her friend and love interest, Peeta Mellark (Josh Hutcherson). Katniss is, however, persuaded to help when she learns that Panem ruthlessly bombed her home district and that the now-captive Peeta is being used for pro-Panem propaganda. Because the events in “Mockingjay – Part 1” are mostly a setup for things to come, the film isn’t as intense or satisfying as previous installments to the franchise. Fortunately, Lawrence continues to impress, and the supporting cast, which includes Liam Hemsworth, Woody Harrelson, Elizabeth Banks, Donald Sutherland and the late Philip Seymour Hoffman is also outstanding. This, and the fact that the film introduces plot elements that will be key to the finale, make “Mockingjay” worth seeing, particularly for those already invested in “The Hunger Games” universe. Director Francis Lawrence, who is also helming “Part 2,” could have likely combined his films into a single, superior project, but commerce routinely trumps art, and this movie is no exception. Blu-ray and DVD extras include deleted scenes and an audio commentary with Lawrence and producer Nina Jacobsen. Director Bennett Miller’s intriguing drama about John Eleuthère du Pont’s relationship with wrestlers Mark and David Schultz didn’t receive any Oscar love despite five nominations. Still, the drama was one of the most interesting and well-crafted pictures of 2014. Miller begins by introducing viewers to Mark (Channing Tatum) and David (Mark Ruffalo). Both men are gold-medal-winning Olympic wrestlers, but their sport doesn’t bring big money, so they live quiet, humble lives. This changes when du Pont (Steve Carell) reaches out to Mark, offering him a place on Team Foxcatcher, an amateur wrestling team that du Pont assembled. Although du Pont lacks the skill and qualifications to train world-class athletes, he fancies himself a mentor, and he and Mark fall into an increasingly bizarre and destructive relationship. Eventually, David is drawn into the fold as well. Those familiar with the du Pont saga know how it ends, but nearly 20 years have passed since the events depicted on screen, meaning many viewers will come to the story fresh. For them, “Foxcatcher” is a clever and illuminating drama packed unexpected twists. The beauty of “Foxcatcher” is that it also works for those who already know the story. Miller and his cast work hard to place viewers inside the heads of the characters, and that results in a sense of intimacy that news reports and magazine articles never provide. As with all biopics, the filmmakers take liberties with the storytelling, meaning viewers who want the facts will have to do outside research. That said, “Foxcatcher” does a fine job introducing the fundamentals of the du Pont-Schultz story in a palatable and engaging manner. The cast is particularly strong, and Carell (who is unrecognizable) shows great range. Ruffalo is always terrific, and his earthy turn as David Schultz represents some of his best screen work. Carell and Ruffalo landed Oscar nominations for their performances (best actor and supporting actor respectively), and the honors are deserved. The only disappointment is that Tatum didn’t also land a nod. His work is on par with his cast mates, and he makes the film better at every turn. Miller’s direction is straightforward and traditional, and that works well with a story like this. It’s difficult to imagining anyone watching the film without being inspired to research du Pont and the events depicted on screen. Blu-ray and DVD extras include deleted scenes and a behind-the-scenes feature. “The Captive”: Drama about parents (Ryan Reynolds and Mireille Enos) who discover that their long-missing daughter may be alive. Rosario Dawson, Scott Speedman, Kevin Durand and Alexia Fast also star. Co-written and directed by Atom Egoyan (“The Sweet Hereafter”). “Tinker Bell and the Legend of the NeverBeast”: The latest direct-to-video, animated feature about Tinker Bell and her fairy friends. In the film, Tink and a pal discover a huge beast in need of help, but everyone in Pixie Hollow is afraid of it. The voice cast includes Raven-Symoné, Ginnifer Goodwin, Rosario Dawson, Lucy Liu, Megan Hilty and Anjelica Huston. “The Humbling”: This cinematic adaptation of Philip Roth’s novel tells the story of an aging actor (Al Pacino) who hopes to quicken himself through a relationship with a much-younger woman (Greta Gerwig). Kyra Sedgwick, Dianne Wiest and Charles Grodin also star. Directed by Barry Levinson (“Rain Man,” “Good Morning, Vietnam”). “The Last of Robin Hood”: Story of the last days of Errol Flynn (Kevin Kline) and his romantic relationship with teen starlet Beverly Aadland (Dakota Fanning). Susan Sarandon also stars. Directed by the men who made “Still Alice,” Richard Glatzer and Wash Westmoreland. “Outlander” – Season One, Volume One: First eight episodes of the fantasy drama based on the novels of Diana Gabaldon. The plot centers on a World War II-era nurse who is mysteriously transported to 1743 Scotland. Caitriona Balfe and Sam Heughan star. “Longmire” – The Complete Third Season: Ten most-recent episodes of the TV drama about a tough Wyoming sheriff (Robert Taylor) who does his job while mourning the recent death of his wife. Katee Sackhoff and Lou Diamond Phillips also star. “Victori – The Truth Just Can’t Be One Thing”: Documentary film about Ed Victori’s efforts to bring the paintings of his father, Victor Victori, to the world. The painter is best known for portraits, including a presidential mural that resides at the White House. Cool reviews. I so agree on the splitting a book thing. It’s all the fault of Harry Potter and I don’t think it even worked for that series. Harry Potter 7 pt 1 wasn’t my cup of tea.